Trakai Historical National Park is part of the Tentative list of Lithuania in order to qualify for inclusion in the World Heritage List. I visited this tentative site in August 2016. Having missed the group visit and after reading that most tours from Vilnius depart after 5pm, I decided to visit in the late afternoon. It turned out to be a wise choice as the sunlight for photography is great in the afternoon, parking was less of a hassle and it wasn't too crowded. The castle interior is nothing special and not worth visiting. What surprised me was that the castle fortifications or high walls are only round the entrance while on the rear part of the island there are no fortifications! This is clearly seen if you go on a 1 hour boat trip or if you hire a paddle boat or canoe yourself. At sunset, there are hot air balloon rides over the castle which added to the overall romantic ambience. I enjoyed the sunset view from my deckchair at the Bona Restaurant sipping cocktails and tasting some delicious kibinas, local Karaite pastries. 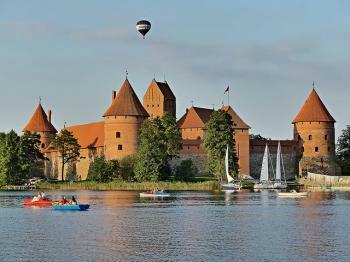 Trakai Island Castle is located about 1 hour drive from the Lithuanian capital Vilnius. It is probably the most visited attraction in Lithuania. It was built in the 15th century. 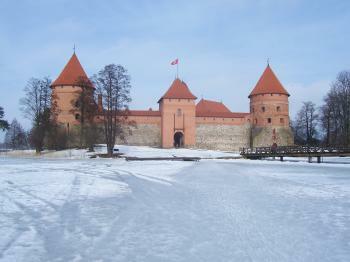 The moated castle stands on an island, between the Lake Galve and Lake Luka. In the fifties of the last century, the island castle was extensively renovated. Since the year 1962, the water castle houses a historical museum. It is a shame that this site will probably not make it onto the list as it was perhaps my favourite site in Eastern Lithuania. The main point of interest is the heavily reconstructed castle. I guess the reconstruction may explain why ICOMOS were not keen on inscribing it as this type of whole sale rebuilding is not particularly favourable in Europe, though Warsaw has set a precedent for this kind of reconstruction. It sits on a small island in the middle of a lake so has a great setting. A friend visited in summer and really enjoyed the relaxed atmosphere so recommended it to me. I visited in February the lake surrounding the castle was completely frozen over, so I had my first experience of walking across frozen water. This may be normal for many people from colder climes but for me this was unique, and it was nice exchanging ecstatic glances with others not used to this kind of travel. There were also several people fishing in the ice, again a new experience for myself. The castle itself was very interesting and had some fine exhibitions on the reconstruction and what it meant as a symbol of Lithuanian identity, especial as this was subsumed at the time in the USSR. Then I retired to the banks of the lake to have an excellent stew of game from the surrounding national park and just enjoyed the relaxing atmosphere. A small word of warning though the Train Station and main bus station are a long 35 minute from the actual castle and whilst the main road which takes up most of the walk is a little dull. On the whole this is a really great place to visit. I can't imagine it finding its way onto the list, however I would strongly recommend visiting if you have a half day or so spare in Vilnius.